Alex picked up a new habit this weekend. When he gets mad at me, he picks up a pen and a stack of purple post-its. 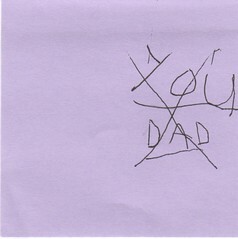 He then writes “dad” or “you dad”, crosses it out, and then sticks the post it on something… the bathroom door, the refrigerator, anything. The power of the written word at work!